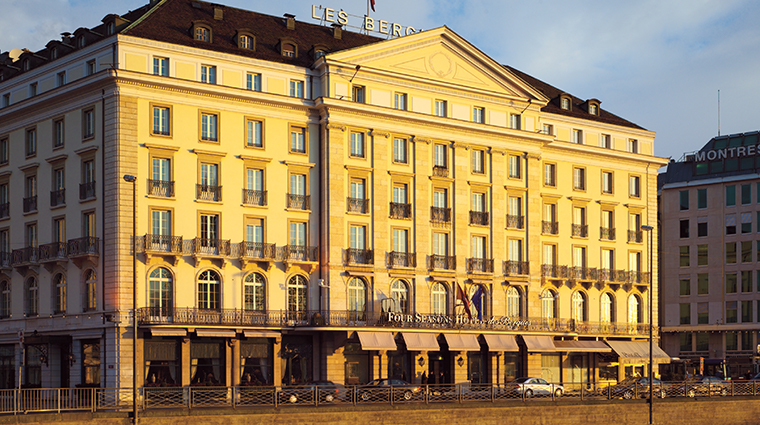 Geneva’s first hotel, the stately neoclassical Four Seasons Hotel des Bergues Geneva dates back to 1834. The building played host to the first assembly of the League of Nations and was once the headquarters of the French delegation. 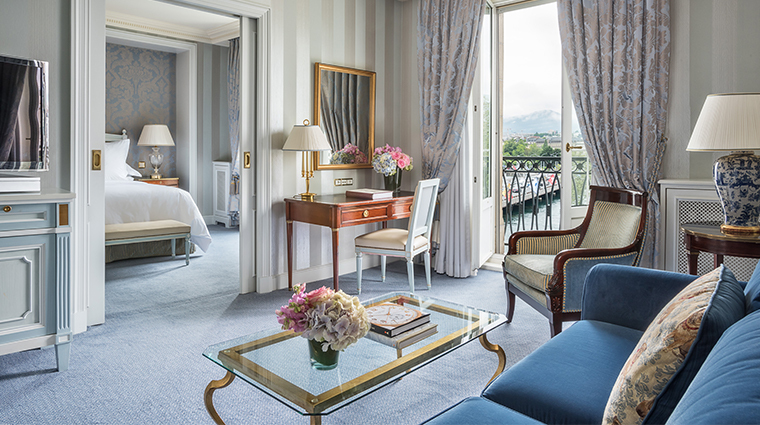 After a meticulous restoration, Hotel des Bergues debuted again to Swiss society as a Four Seasons property in 2005. 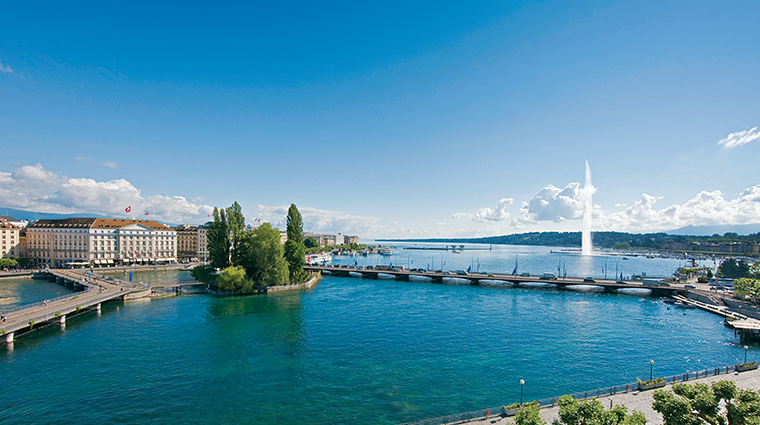 Located in the heart of the city on the banks of Lake Geneva, the opulent hotel is traditionally French but has some unexpected (and welcomed) modern touches. 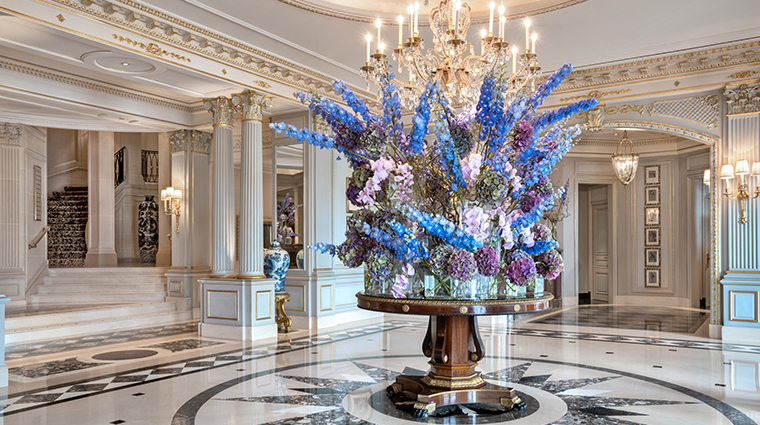 A fine Italian restaurant, an ultra-luxurious spa, a sky-lit indoor infinity-edged pool and that famous Four Seasons service make this grand hotel one of the best in Geneva. 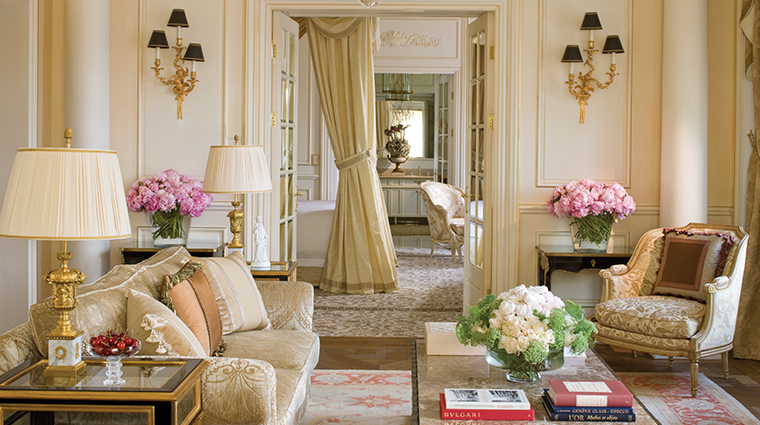 Famed French interior designer Pierre-Yves Rochon conceived the luxury hotel’s 115 rooms and suites. 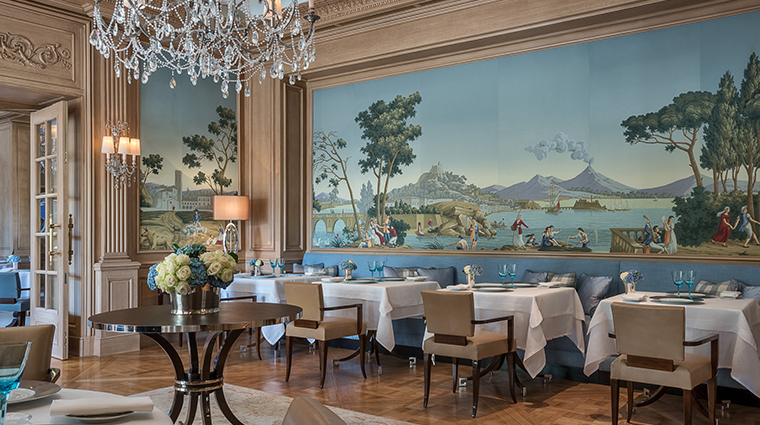 Frescoes, large windows overlooking Place des Bergues, candelabras and objets d’art create an elegant setting for dining on Northern Italian fare at Il Lago. 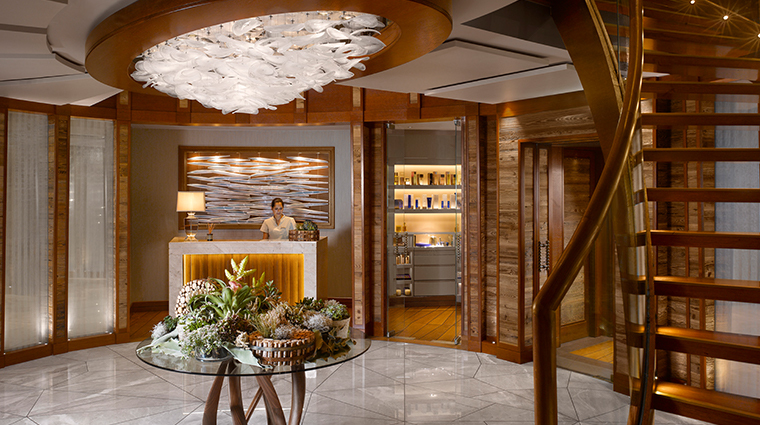 Open 24 hours a day, the 1,000-square-foot fitness center provides a variety of cardiovascular and strength machines from Technogym and Matrix, plus fitness balls, weights, stretching mats and complimentary fruit and juice. 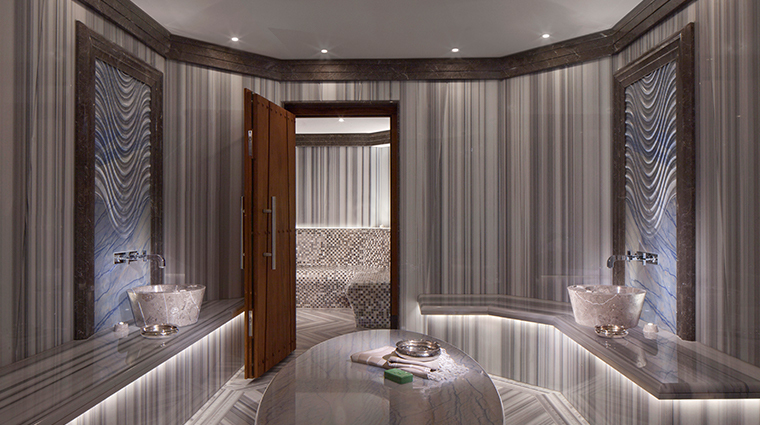 Comprising the hotel’s top three floors, Spa Mont Blanc is a pristine, modern oasis. 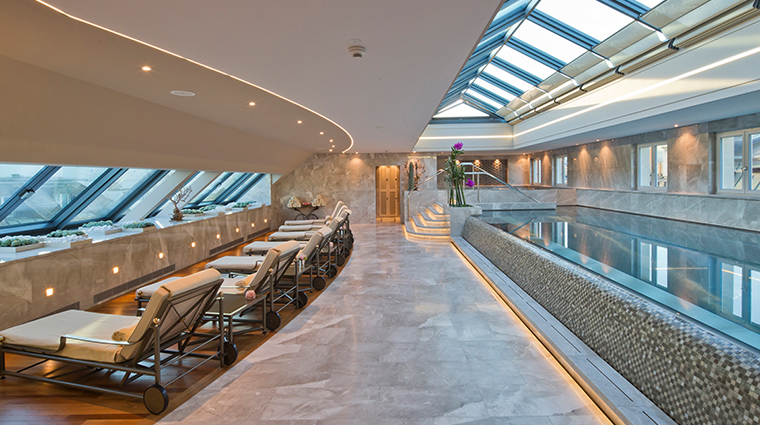 Full of light, the 30,000-square-foot facility features seven treatment rooms, gorgeous Turkish marble hammams, a rooftop indoor heated pool, a hair salon, a cozy library with a fireplace and signature treatments featuring local products. 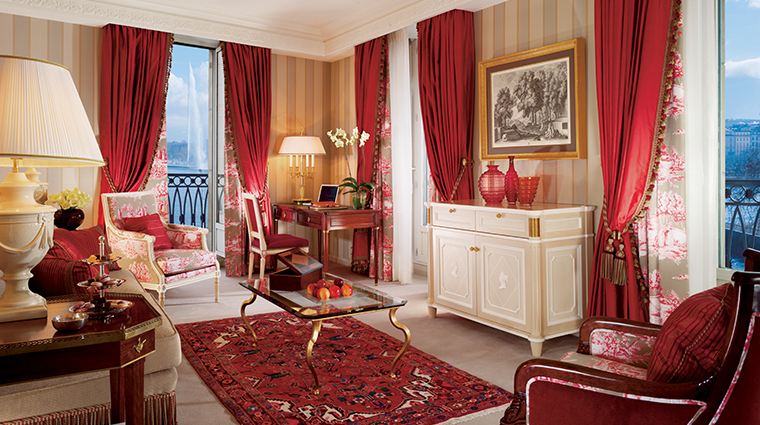 Enjoy the services of a guest personal assistant available on each floor. 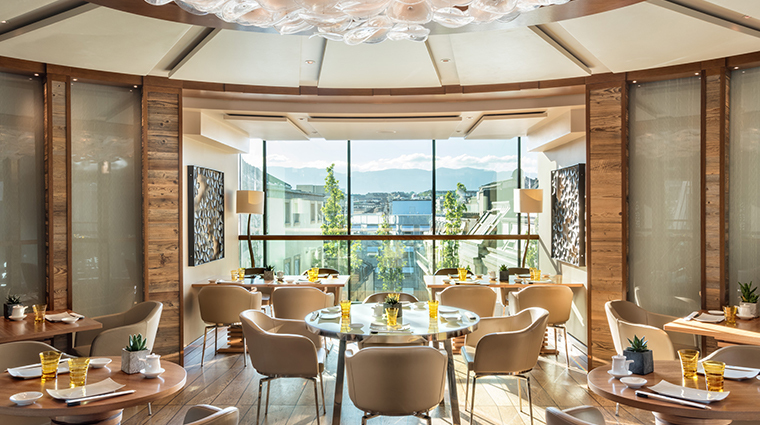 With space for only 25 guests and stunning 360-degree views around the city and beyond, it’s best to book early if you want to dine at the popular rooftop restaurant, Izumi. 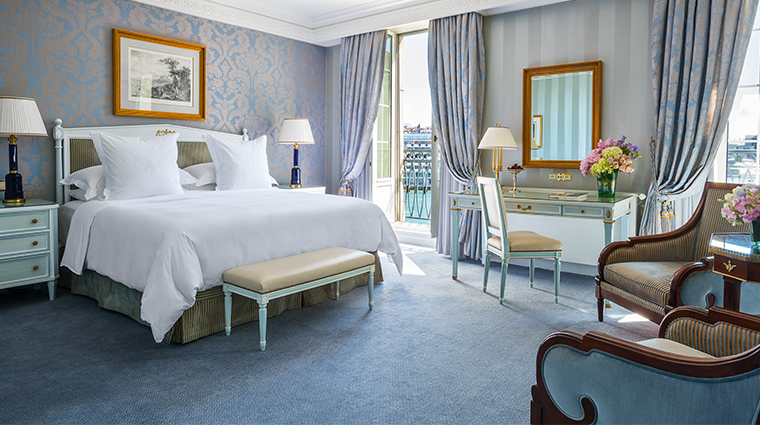 Full of light and high ceilings, most of the rooms are decorated in a classic French style, with Directoire, Louis XVI and Louis-Philippe furniture, crystal chandeliers, rich fabrics and gilt mirrors. 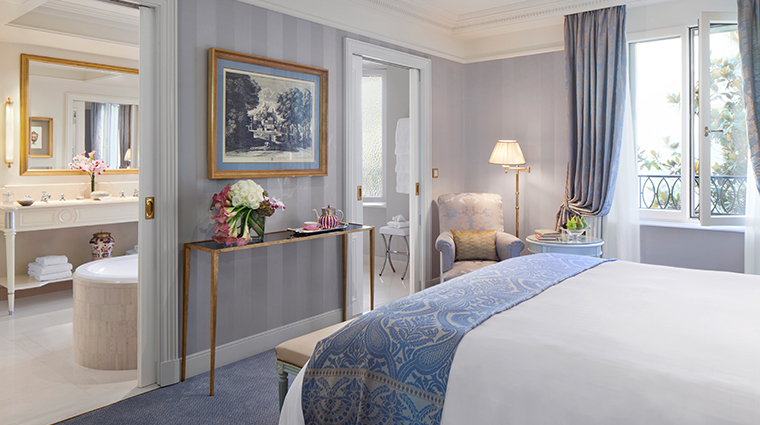 A tranquil palette of blues and greens are a nod to the colors of Lake Geneva and the nearby Alps, which are visible from many of the rooms’ large picture windows. 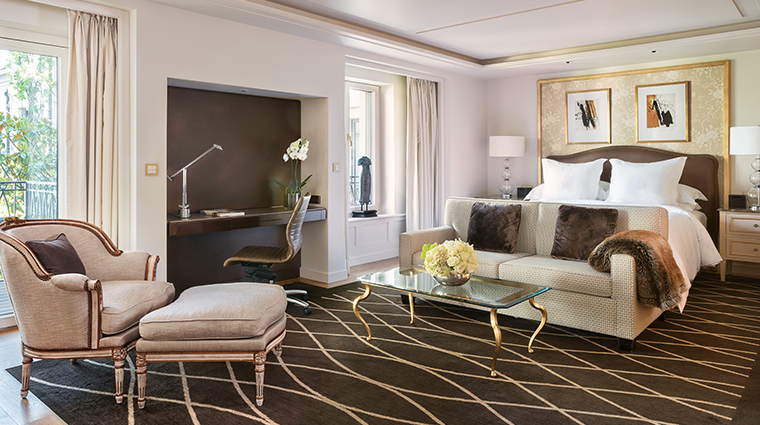 All rooms and suites in the luxury hotel include a spacious marble bathroom with deep-soaking tub, shower, bidet and steam-resistant mirrors. 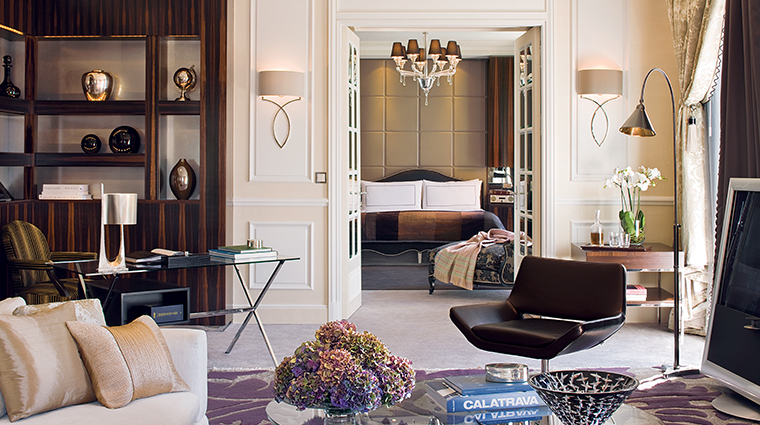 In direct contrast to the Léman Suites’ brocade and toile are the Loft Suites. 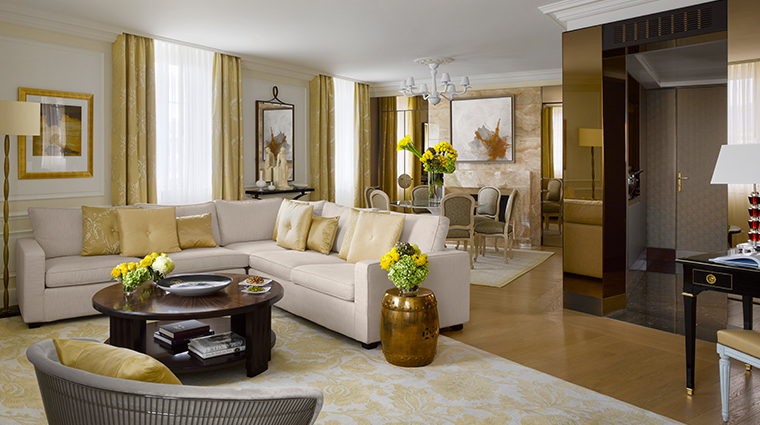 Contemporary in design, these executive suites feature cream and brown, which give them a more masculine feel. 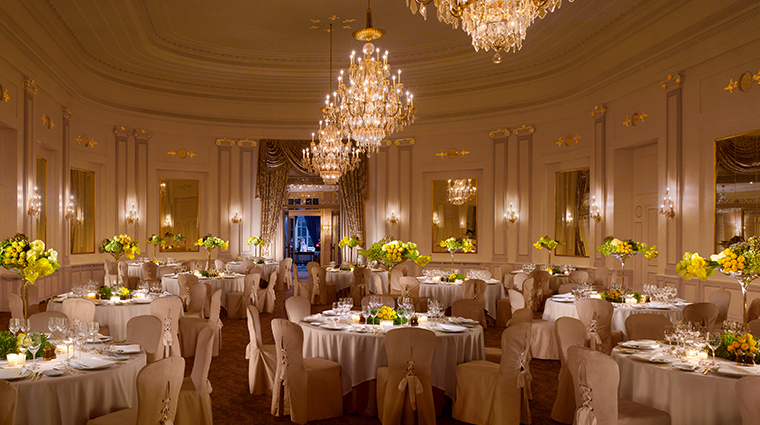 Whether breakfast, lunch or dinner, a meal in the dining room of lavish Il Lago feels like a special occasion. 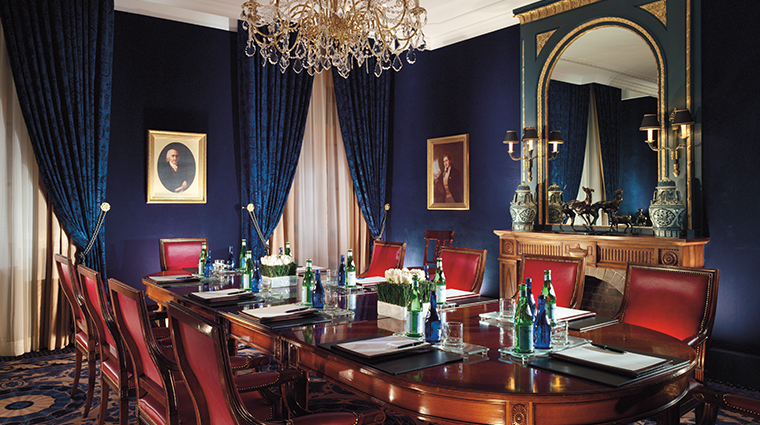 Il Lago has a menu of Northern Italian fare by chef Massimiliano Sena and quite an impressive collection of wines. Adjoining the restaurant is Le Bar des Bergues. 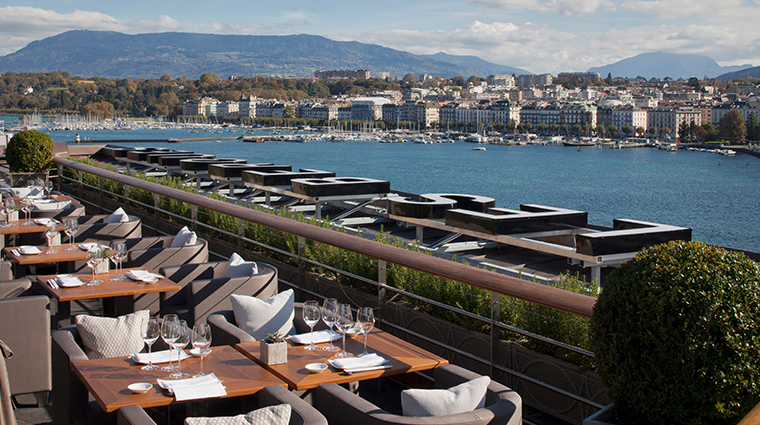 With views over Quai des Bergues, the bar is the place for a cocktail or light bite. Serving a Japanese-Peruvian fusion cuisine known as nikkei, chef Mitsuru Tsukada's Izumi is open for lunch and has two dinner seatings on the rooftop terrace.